I'm always keen to take part in competitions, especially when it involves fashion! I noticed that Travelex had launched an exciting competition called 'Get The Look For Less'. To enter, you need to look at the top 5 trends of the year, pick one you like and then search the internet for items you could use to recreate the look for under £100. As a fully-fledged lover of bargains, I was up for the challenge and created this military style outfit. See full outfit details here. Once you've created your bargain outfit, share it on your blog and upload your entry on the Travelex 'Social Voting App' and a lucky blogger could win £200 worth of shopping vouchers and currency. The competition is now live and will run until the 5th November. Enjoy creating your outfit and good luck! Also, please vote for my outfit if you like it - You can vote for my outfit here! I love military style and your take on it is amazing! That jacket is just beautiful. Good luck with the competition! 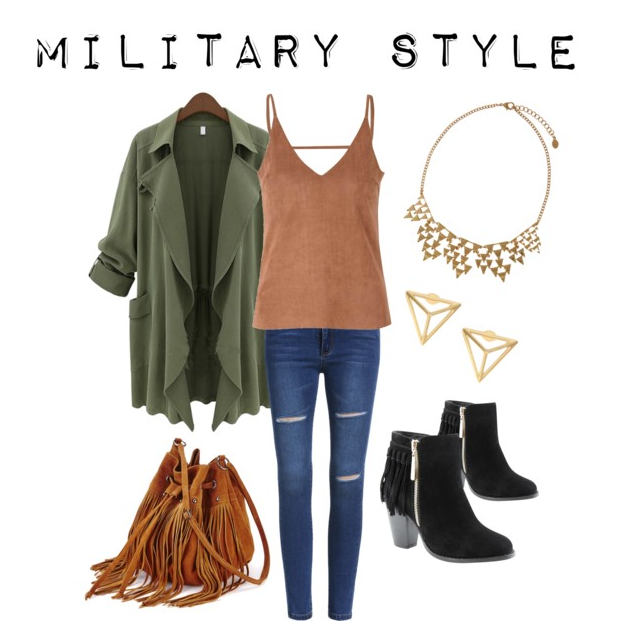 i love military style, especially the olive green color! such a great color for fall! I love your combination of clothes, and the military style! I like military style and you created a cool look! Great post and amazing pictures :)...thx for sharing! have a lovely week !! Great picks, I love the bag dear! Love everything about this look!! I love those boots, they're perfect for the Fall and looks stunning with military style! Great post and wonderful pics! Your blog is wonderful, Congratulations ! I am following , you could follow too? Wow, that jacket is fantastic!! Lovely find. I love that jacket. I saw a similar one a few days ago and have been wanting it ever since. Niiice! I love it when masculine stuff are made chic and stylish. The military jacket is very stylish ! I love this look and I love that it doesn't cost a lot! Good luck with the contest! Fingers crossed that you win! Oooh, this is such a cool look - love that jacket! Love the look that you chose. I really love how military style is in for fall. I bought the BEST military-style jacket not too long ago and it's so versatile. I wear it with everything. Love your little blog, by the way. Electric Sunrise is such a creative name! Love this the jacket is great! I absolutely adore the jeans and that top! and the jeans are only £10 ... WHAT! Never heard of that, I always buy Topshop, which ruin too bloody quickly anyway! Hello I'm Helen and welcome to Electric Sunrise; my very own personal style, fashion and lifestyle blog. © Electric Sunrise | All rights reserved.